When I went to Japan in 1997 to study for a year, it was my first time out of the United States. I knew Japan would be different, but I had very few expectations. I went out there with a year’s worth of Japanese, eyes wide open, and a brain ready to soak it all up. Of the many, many cultural peculiarities I noticed in Japan, one of the most convenient was the tissue pack advertising. It’s a simple method. Someone goes to a crowded metropolitan area with a box of small packs of tissues. On the tissue packs’ plastic wrappers is advertising. 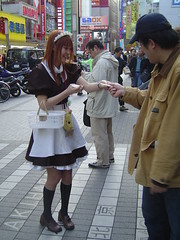 People are quite often willing to accept free tissues, and happily carry the advertising with them wherever they go. Everyone wins. When I first arrived in China, I discovered how important tissues are here. You use them as napkins, you use them as paper towels, you use them as toilet paper. You really shouldn’t go anywhere without a small personal tissue supply. I found myself really wishing that the Chinese would adopt the tissue pack advertising method. Here in Shanghai the primary method of street advertising is handing out business card-sized ads in and around the subway stations. I imagine it doesn’t work well at all. The workers handing out the cards are extremely annoying, and no one wants the cards. Subway sanitation workers are always sweeping them up. It seems like the tissue pack advertising method would be perfect for China. I have actually seen the method used here in Shanghai at least twice. I got a free pack of ad-swaddled tissues outside of the South Huangpi Road (黄陂南路) subway station just last week, and I saw it once before, a long time ago. This really needs to catch on. They used to do this all the freakin time in Beijing, especially for new apartment developments. It was really annoying, since to cut costs they only put two tissues into each pack, and people would just toss the plastic on the ground within a block or so, and the sanitation workers had to sweep them up. I imagine the city cracked down, since I haven’t seen them in over a year. Two tissues?! Wow, that is really cheap. If I recall correctly, in Japan it’s usually something like eight per pack. The conversations we never get to have together at work! Interestingly, in Taipei they also have the tissue advertising scheme. I used to like it, until someone did an expose on the practice, and pointed out that the tissues are actually unhygienic – stuffed into the tissue packs by someone by hand…ew gross. Then i didn’t want to really use them any more. But maybe i’m just a bit germ phobic. That’s why i’m afraid of our ayi’s dirty black mop at work when she comes around mopping in the mornings… he he. Now, not to reveal too much here… but umm… eight is definitely NOT enough (despite the obvious pun). They’ve been doing the tissue thing here in Taiwan ever since I got here. I’d imagine making a tissue packet is a lot more than busniess-card-sized ads. I’d say it’s the cost consideration that’s keeping the tissue as ads down in China. yeah I think most Chinese businessman have shortsight, they will carefully budget, trying to find an exact (hope it exists) balance between cost and profit. With this kinda quick-get-money mode, it will surely result a far different way to do the advertising. And I have the same feeling discomforts me like amber’s. I’d imagine making a tissue packet is a lot more than busniess-card-sized ads. I agree with Kastner here… it’s just shortsightedness. Sure the business cards are cheaper; that’s a no-brainer. But what good is spending money on something no one is going to look at and will likely end up in the trash right after it’s passed out? The tissues work. I’m not surprised at all to hear that… Taiwan has borrowed quite a bit from Japan. I see tissue pack promotions every couple of weeks or so here in downtown Shenzhen. But I see more during infrequent day trips to Hong Kong. Yet the companies are pretty much always the same. I think it’s a good form of advertisement for a company every once in a while, but when it’s the same company or restaurant doing it again and again you kinda get immune to it. But yeah, much better than cheap quality business cards. Seems like it would be something to recommended to a company, like, say. ChinesePod (who could put both Chinese & English on the pack). Maybe you could reach across the sea to Kimberly Clark, Scott, Kleenex, etc. who might be looking for an opportunity not only to sell advertising tissue packets but also to advertise themselves. Why’s it say Beijing on the Japanese Street? The irony is that that in some restaurants, you get charged for a tiny packet of tissues (to use as napkins) with the restaurant’s name on it. I like the Korean method of street advertising. Take a few beautiful women, put them in skimpy clothes, give them a bullhorn and a boom box playing Korean pop music and have them talk loudly with the music and give out samples. Always draws a crowd. Here in Kunming I sometimes see people hand out flyers with a free plastic bag. The fact that the free plastic bag is enough to get people to take the flyer, and it is, seems bizarre to especially since everyone in this country has trash cans full of plastic bags.